(D No. 3) Preliminary Chart of the Entrances to Cape Fear River and New Inlet North Carolina. 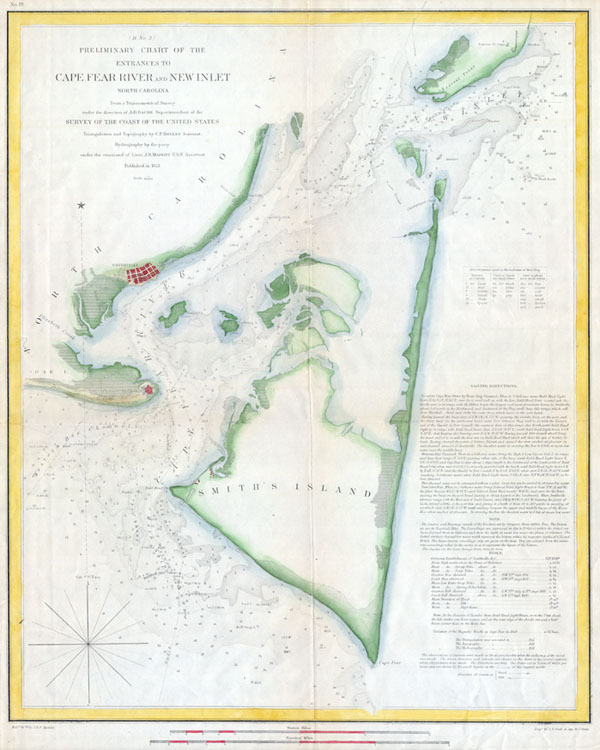 A rare hand colored 1853 coastal chart of coast of North Carolina near Smith's Island and Cape Fear. Details the entrance to the Cape Fear River and New Inlet. Includes detailed sailing instructions, references to light houses, depth soundings, and notes on Fort Caswell and Smithville. Published under the direction of A. D. Bache for the 1853 Report of the Superintendant of the U.S. Coast Survey. Very Good condition. Blank on verso. Good margins.